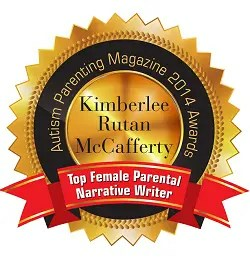 My name is Kimberlee Rutan McCafferty, and I am the mother of two wonderful boys, ages three and six, both of whom have autism. Six years ago I was a resident of the great state of Virginia, living twenty minutes from the White House and reveling in the fact that after two years of fertility treatments and several miscarriages, I finally had a kid. Six months into my parenthood journey I had mild concerns about my infant’s behaviors that were not shared by my pediatric group; a year later they finally were. My oldest son Justin was diagnosed at seventeen months with Pervasive Developmental Disorder, a label followed half-a-year later by the one we’re all so much more familiar with, autism. To say this wasn’t a pleasant time for our family would be quite the understatement. I quickly realized the services for children in Virginia through the state’s Early Intervention program were almost non-existent, and if we wanted him to have a comprehensive home program without entering bankruptcy, the job would fall upon me. I quit my teaching job, got trained in the core therapies for autism, and was his primary therapist for the next fifteen months. Since massive amounts of quality therapy at an early age is about the ONLY thing the myriad factions of the autism community agrees is a good thing for autistic children, I dove in and worked at least six hours a day with my son for over a year. When I eventually realized our school district’s program would not be right for him when he became of age, we decided to relocate back to my former state of New Jersey. There, Justin would not only have a one-on-one aide, but would actually receive Early Intervention services not conducted by his exhausted and perpetually cranky mother. It was a win-win. We quickly settled into our new home. 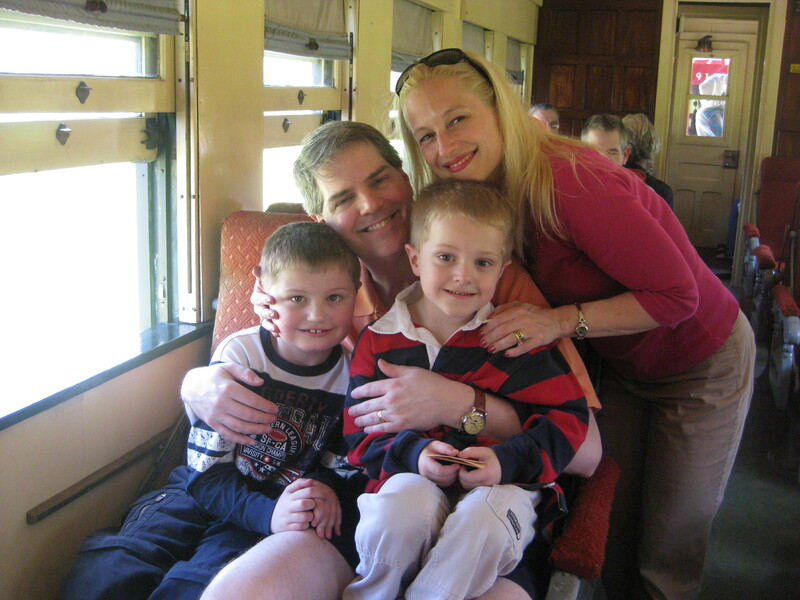 A few months later my husband Jeff and I were pleasantly surprised to discover we had forgotten to claim something at customs upon our return trip from Aruba, a little something who eventually ended up being our second son, Zachary. Other than a slight speech delay during his second year, Zachary’s development was completely different than his brother’s. Not only did he hit every milestone on time which Justin also had done, but he displayed none of the “extras” which had so concerned me during the first few years of my older son’s life. 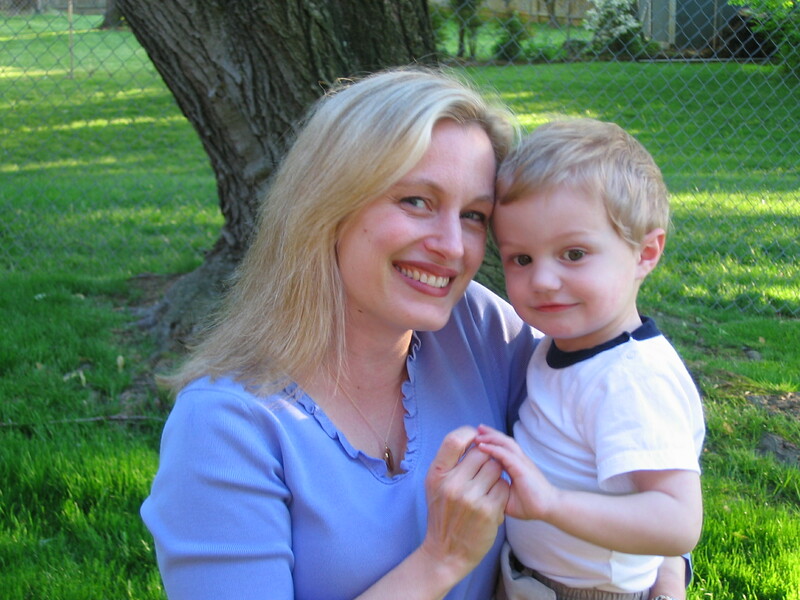 Unfortunately when Zach was twenty-months-old he was taken ill twice in one month, and within weeks began displaying the classic symptoms of autism. These were not good times chez McCafferty. I quickly realized my life was not exactly going in accord with my extravagant plan of marrying a good guy, having two healthy kids, being an educator, and cultivating a healthy attachment to a fruity pinot grigio and being in bed by 10. It was pretty obvious the career had to stay in the crapper so I could continue to don the mantle of “mommy-therapist”, and heavy drinking was out if I wanted to be any good at it. Since I am the suckiest martyr ever I decided I had to have something for me, something more than the satisfaction of seeing that sixth load of laundry get folded AND put away. So I decided to write a book, even though I hadn’t written anything longer than an email since grad school in the early 90’s. Creative writing was the only course I’d gotten an A in during college, so I figured what the hell, and went for it. I thought I’d just whip it out in a few months. It took two years. Part of the reason it took so long was my inability to function after 7:30 PM, and in part it was those damn kids getting in the way of my writing. They are just SO time-consuming! 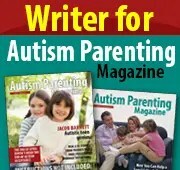 Eventually I did finish it, and now have turned my attention to becoming (just slightly) famous through my blog, so I can get my manuscript published and achieve my goals of opening as many doors as possible for my sons, and helping other families struggling with autism. So here I am in the blogosphere. Before I decided to go this route however, I felt compelled to explore other avenues to fame simultaneously. My alternative opportunities were twofold. Join the cast of a reality TV show (Jersey Shore is practically in my backyard), or exploit the famous people I’ve met. Since I don’t have nearly enough tattoos to qualify for the Seaside Heights venture (and there have been no casting calls for cougars), unfortunately I feel I must shun this option. Sadly, its proximity would have made it so convenient, and I do tan well. It’s a pity. So, that leaves the shameful exploitation of celebrities I’ve encountered in my travails. There are three. First, there’s Dirk Benedict from the original version of Battlestar Galactica, whom I tormented in the Theater in the Round in NY in the mid 80’s when I was in high school. I made him give me an autograph and blew his cover. I doubt he’s forgiven me, so he’s out. Then there’s Bill Clinton, whom I met while chaperoning my students on a field trip to a Baltimore Orioles game. Mr. Clinton shook my hand in a completely random moment of kindness (because, clearly, I am a person of no importance), and I responded by forgetting every pithy, clever comment I’d been honing and instead greeted him with a slightly subdued and breathy “hi”. Somehow, I don’t think he’ll remember me. Last, and most lucrative, is my little brother. He’s a death metal rock star. Yes, I can claim stardom for him since women on the street stop him to have their picture taken with him (every time it happens with me around gentle mocking ensues, it is GREAT fun). I’m certain he could make me famous at his concerts by incorporating autism into his lyrics, somewhere between the references to rotting corpses and rancid brains. Since I kept him alive on Kraft macaroni and cheese for a few years during our childhood, I figure he owes me. After indulging in my fantasies of a quick trip to fame for some time, alas, in a moment of clarity, I have come to realize I will just have to buckle down and get my name out there the old-fashioned way, simply by writing. So, if you’ve received an email about this blog you either know me or my mother, and despite the fact that we’re all insanely busy these days, it would be great if you would visit it from time to time, perhaps leave a relatively appropriate comment, and badger everyone you know to visit it too. Thank you, and I promise (REALLY!) to respond!